Your bathroom design should be a personal oasis; a warm, welcoming space where you can enjoy a bright start to the day ahead or relaxing to unwind after a long day. A zone of peace where you can add colours and stylish accents to create an inviting look that will give you a cozy modern bathroom experience. According to the Export dept Manager at Minacciolo in Italy, as every project depends on the needs of the final costumer, African trends are difficult to define; anyway there is probably more interest in the classic collection due to the fact that it expresses elegance and luxury which are always appreciated in every situation. Mr. Craig Taylor of Bathroom Butler a manufacturer of top range bathroom accessories and heated towel rails in South Africa further mentions that, the African culture is known for showcasing their artistic flair by using arts and crafts. However, Seb Ackerstaff of by COCOON from The Netherlands affirms that, as trends will be different each year, timeless design and quality will not. “We try to avoid trends. By making our products timeless and from everlasting materials, they will even stand out after decades of use,” he adds. Introduce an area of visual emphasis as the main décor highlight in a bathroom, immediately drawing attention, inviting you to step inside to enjoy the experience created by the dramatic impact of the focal design. 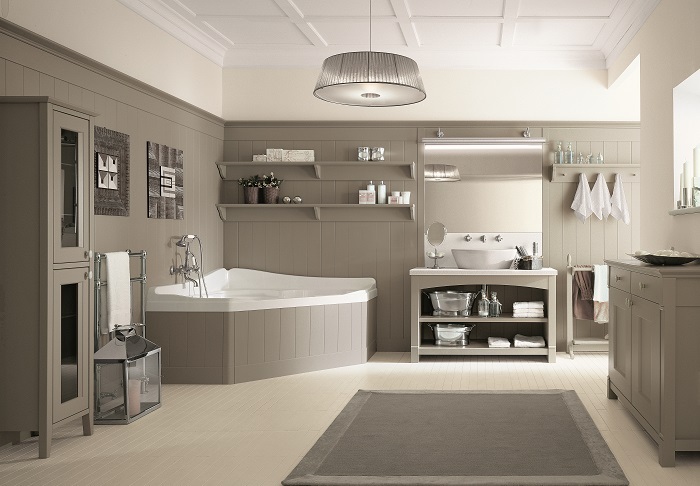 Choosing elegant bathroom features such as a beautiful vanity or trending standalone bath. Vanities are a great spot for a little extra attention, and tiling around the mirror heightens the ambience and adds interest to the bathroom. The bath brings a special touch with its beautiful contours and design. Quartz counter top with sunken basins create an engaging effect, giving a feeling of luxury. The streamlined feel of this design creates a sense of flow, gently directing the eyes to this design element. 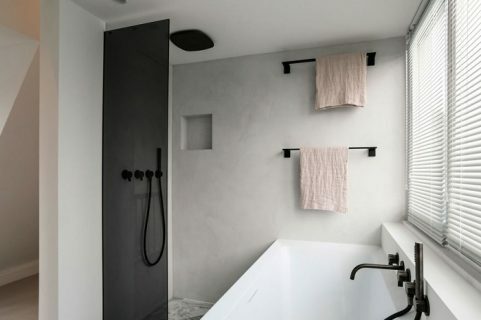 According to Yaniv Belinky of Tapitalia a distributor of high quality and high design products from South Africa, minimalism, although a cliché, is definitely the dominant trend being followed in the design of modern bathrooms. Neat, compact, wall-hung cabinetry with innovative maximized storage spaces, and integrated basins with hidden wastes, create the perfect clean geometric lines with continuous surfaces. and are currently in high demand. 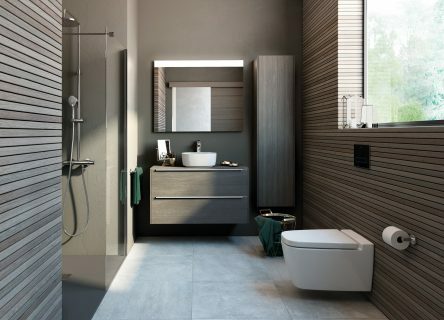 “Free standing baths and bathroom objects allow for a more fluid environment that can constantly change and adapt around the users’ current needs and lifestyle. The use of new materials is continuously explored by designers and manufacturers, resulting in new and exciting aesthetics, striking finishes and better quality durable products. There is a definite trend of de-cluttering and the desire to create soft, harmonious and inviting atmosphere for rejuvenation and relaxation,” he adds. Moreover according to Luisa Hellwig of Vallone a provider of high class design sinks and bathtubs manufactured from a premium mineral velvet stone in Germany, the blending of bathrooms and bedrooms to one suite is also quite important for that luxurious feeling. Wood look tile flooring has become one of the hottest trends in the flooring industry today, creating an inviting effect with the benefits of durability. It is easier to maintain than real wood, while providing the inherent charm associated with the material. The inkjet manufacturing processes enables ceramic and porcelain tiles to resemble natural wood. One of the big advantages of this is that there is no longer a restriction to standard sizes and tiles can now be manufactured in a rectangular shape, adding to the versatility and cost-effectiveness of the design. This also enables different effects such as the parquet floor finish. Technical advances allow cutting edge detail, enabling these products to imitate the look and feel of a hand scraped wood floor. Mr. Alfonso Albella Campesino of Antic Colonial in Spain, adds that ceramic tiles are also very popular flooring options in the African market currently. Mirrors add warmth to a bathroom, reflecting the contents and adding a 3 dimensional effect. Extra touches can be achieved by a his and her mirror for couples sharing a bathroom. Mirrors can enhance a bathroom style. A traditional mirror in a beautiful, delicate frame can be used for a more classic design while modern styles favour mirrors which may or may not have sharp or rounded edge. More expensive models, have a glass preheat function to prevent fogging. Some may include a “hidden monitor” where at the push of a button the mirror turns into a screen where video can be viewed. There are also models with touch-sensitive buttons that communicate with your phone via Wi-Fi, allowing you to enjoy your favorite music without having to leave the bathroom. 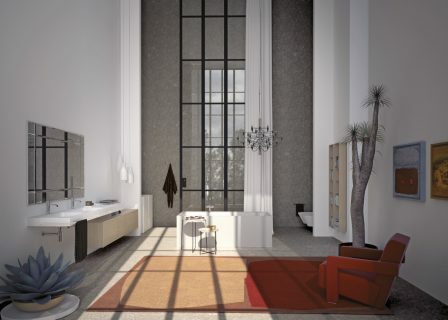 According to Maison Valentina a manufacturer of new luxury bathroom brand concept with high-end solutions in Portugal, the current African market is all about new luxury which include round mirrors and an all white bathroom with a touch of luxury. Showering can provide a refreshing alternative to a bathtub. A shower can contribute to a bathroom’s cozy ambience with its own special features, creating an inviting world on its own. Recesses in the shower wall have their own special charm while also assisting with overall storage. The choice of shower head can enrich your showering, such as choosing a rain shower which simulates the effect of rain. The shower experience has been further expanded with shower seats which have become a popular trend, enabling you to indulge in your shower experience while resting on a seat which also provides additional storage for toiletries. Even the shower wall offers many design options to enhance the enjoyment of the bathroom from creating a unified, seamless look by continuing the tiling of the bath, or introducing a mosaic pattern which highlights the area or it can even continue the design pattern of the rest of the bathroom. 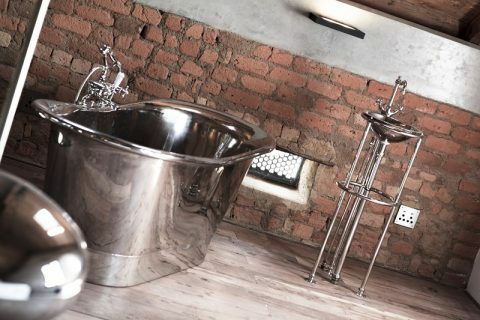 According to Copper Bath a supplier of hand made copper baths basins, and tapware in South Africa, with regards to basins, an interest in metallic basins has really grown over the years. “However, despite the trends, it is important to ensure the type of product you choose has an enduring look that will stand the test of time,” he adds. Ms. Sandra of OXO Bathrooms a supplier of Italian design bathroom sanitary ware from South Africa, is of the mind that, square shape taps, basin and baths are taking over the market; but reiterates that, due to the fact that these products sanitary ware and not cheap to replace once the trend is over, it is important choose timeless products. Lighting plays a role in setting a welcoming mood. Choose light fixtures which compliment the design theme of your bathroom. Warmth can be created by using light bulbs that allow colours to look natural. A special lighting effect can be achieved by using LED lighting under the vanity or under a bathroom shelf, recess or step to create an intimate ambience, while additional warmth can be infused with non-fluorescent lights on each side of the mirror of the vanity. Recessed ceiling lights are also ideal, especially with dimmers where you are able to set the intensity of the light and create a feeling of cocooned warmth in your bathroom space. Skylights provide another option, allowing you to enjoy your bathroom experience under the stars or while watching the sun rise. Colour has a direct impact on creating a mood of peace, calm and warmth. Warm and vibrant colours can be used as well as autumnal hues, as long as they are not too intense so that the overall effect is still peaceful and inviting. For instance, Mr. Johnny Lamprecht of Bathroom Bizarre is convinced that white sanitary ware with chrome trimmings are the way to go these days. “White matches everything and this gives one the ability to play around with colours when decorating with towels and other decorative things,” he says. Using bright colors, pastels or warm colours such as peach, terra-cotta and pink tones which usher in a source of interest, while creams can also be used effectively to create an inviting touch, with further character introduce by spots of coloured tile. According to Kirsten Stigling of Lavo a provider of breathtaking array of bespoke designs and materials including Brassware, Bathtubs, Toilets, Bidets, Basins and all manner of accessories in South Africa; Copper, Gold and Rose Gold finishes are really making a splash on the Bathroom scene, internationally and locally. 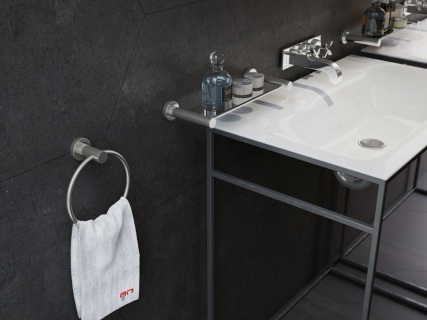 Furthermore Zerona of Bella Bathrooms a provider of a wide range of bathroom products, adds that modern minimalistic as well as contemporary design is trending, black and rose gold taps and finishes are being utilized more by the leaders in the design community. Having an ottoman or a chair in the bathroom adds an exotic touch. It also has practical value, allowing you to sit down and relax while you wait for the tub to fill with water or brush your hair. Ottomans have the added advantage of doubling as storage containers. Occasional furniture also works well in maintaining continuation of style and colour with their novelty lending to the creation of a warm atmosphere. According to Filippo Braccioni the Export Manager at Sign a manufacturer of bathroom furniture in Italy, colored ceramics basins are also quite popular in the current market. Often one personality-filled piece in a strategic position can create an ideal finish to the bathroom décor. The subject of the painting can also contribute to the overall theme of a warm, inviting room. Looking at subjects such as sunsets, or water related themes from Impressionist paintings such as Manet’s water scenes, Monet’s Water Lilies or Camille Pissarro’s landscape or sunset scenes. Choose paintings with colours which work with the overall bathroom colour – whether by creating a source of contrast or accentuating a bathroom colour. Abstract paintings also work beautifully as do black and white prints. In fact, you can use any painting which reflects your style and which contributes to the overall décor effect of adding to the character and warmth, making it a special inviting space. Mr. Enric Alvarez Calvo the Export Area Manager at Roca a pioneer in supplying everything for bathrooms from Spain mentions that, if our present already demands a commitment to sustainability, in the future this commitment will be unavoidable. “We advance towards technologies and products that ensure the minimum energy consumption, an optimized use of resources, with the best performance and an increasing customization capacity. Consumers will demand clean products, that use little or no energy at all and that, as well, provide pleasant experiences adapted to their tastes and needs,” he adds. Nevertheless, according to Joslyn of Victorian Bathrooms one of the worlds specialist suppliers of luxury bathroom products in the classic style, trends come and go and we recommend that you stay away from ‘here today, gone tomorrow’ fashion fads. Select a style that is timeless and that will continue to ‘hold the spell’ of opulence for years to come. This is superb.Who doesn’t love coziness. Mind blowing ideas and trends you have shared.You have such a great choice.You gave me such great tips to renovate .Thanks for the wonderful collection.This tips are simply amazing.I am really glad that I came across such a great article. Very Nice, having a cozy bathroom everyone will love to have. Bathroom can be relaxing ,make a wall pianted with different colorrs and have lots of natural light to come in from window. A refreshing air can make more relaxing and beautifull atmosphere. Thanks for this tips .I will try this tips. Great & wonderful designs. Very very smart. Just love this. I will obviously follow you. Keep up the great job. God bless. Your blog has helped me by giving updates on the new apparatuses and structures that will make my shower renowned.